Above is a photo of a new "sky island" species of Vaejovis. 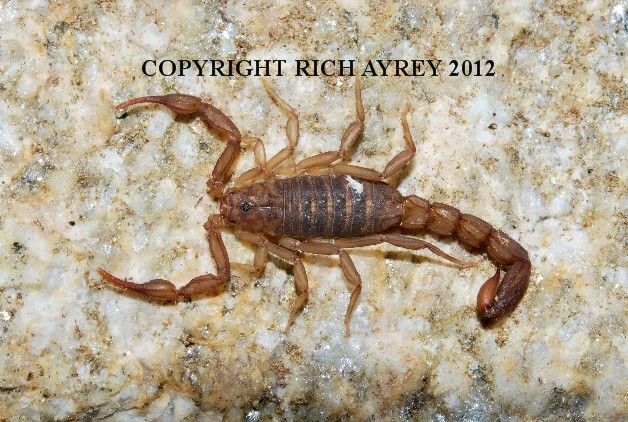 This Arizona Scorpion pic was taken on the Mount Lemon Highway, Santa Catalina Mountains near Tucson, Arizona. Vaejovis brysoni is related to Vaejovis deboerae, also found in those mountains, but is a distinct new species. Download the species description here. I am very fortunate to have pics of rare scorpions like this one. This Flagstaff Arizona Scorpion site © Rich Ayrey 2013 - 2017. Arizona Scorpions World page created 01/22/2013.